When an Impact 32 team came up with the name Vibrant Village, they also came up with a plan to back it up. Bobcaygeon volunteers are making the village fun and attractive this summer, and people are showing a lot of interest in some unique new ideas. It's all about the paddles this year, just ask anyone in town. 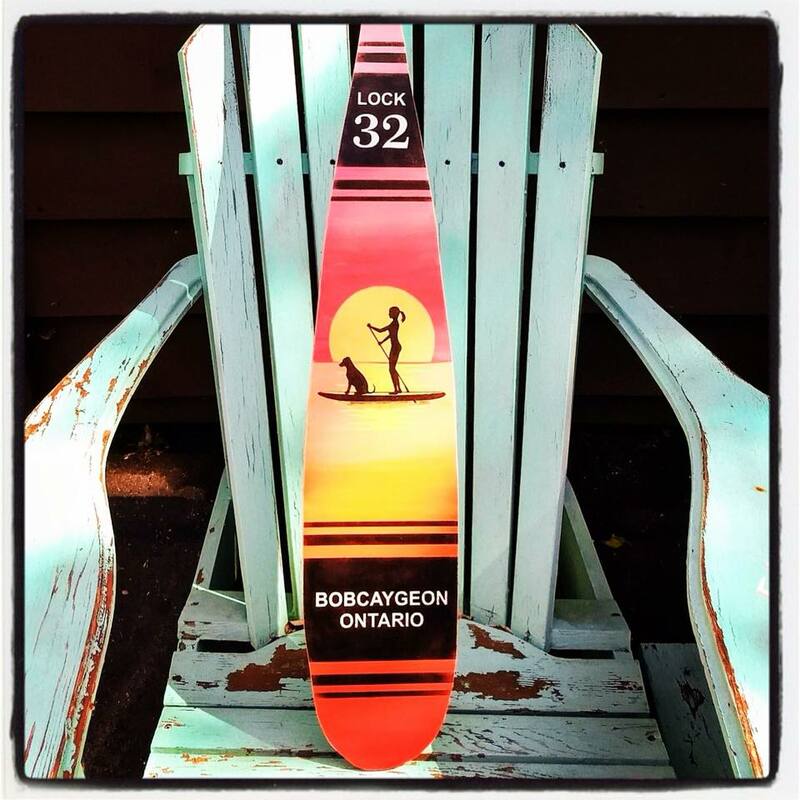 The canoe paddle was chosen to reflect Bobcaygeon's heritage as a main waterway route for both First Nations and settlers. And these are beauties! Seventy wooden paddles, each uniquely painted, will be showcased on poles on the main village streets. Local artists made a special effort to create work that represents favourite aspects of this vibrant village. As the summer season winds down, the paddle art will all be auctioned off to community members and merchants to raise funds for future beautification. Volunteering is not without its ups and downs of course, just ask the ladder crew hanging those gorgeous big flower baskets in the downtown core. Back by popular demand, and showing every sign of being just as bloomin' beautiful as last year. Be there or be square -- There's a 60s party going on at Kawartha Coffee's new pad with the groovy patio at 58 Bolton. Righteous Bobcaygeoners will be releasing their inner flower child at the happening Boho Bloom Town Bash on July 6. Fab food, karaoke, henna artist, flowers in your hair, and all the starlight you can handle. All in a good cause -- raising funds to keep the village looking tidy and beautiful, including helping fund the Communities in Bloom entry. Tickets are for sale at Kawartha Coffee and online at www.VisitBobcaygeon.com. Representatives from local volunteer groups have joined together to enter Bobcaygeon in this year's Communities in Bloom competition. “Plants, people and pride . . . growing together” is the vision. The combined effort is proving to be an experience that's spurring the groups on to make plans to continue working together. Anyone who wants to help Bobcaygeon win the competition can go to the website www.BobcaygeonCommunitiesInBloom.com for tips, and look for 'seed bombs' at any of a dozen merchants around town -- pretty little gifts you can plant for just $5. Bikes are back too! Bobcaygeon's bike share initiative is open for business again, all you need is a cell phone and a credit card. Again located in two handy spots beside the locks, they're ready for residents or visitors to take for a spin. And visitors can now easily find their way around this vibrant village by checking out the new signposts, paddle-shaped of course, and designed to complement Bobcaygeon's charming 'old-time cottage meets today' feel. Thanks go to another combined effort, this one by Environmental Action Bobcaygeon and Impact 32, supported by C.H.E.S.T., Regional Tourism Organization 8, and the City of Kawartha Lakes. Media contact: Bonnie Harris headlaker@hotmail.com (705) 738-9949. Newer PostHunt for all the paddles and vote for your favourites!